The Derby della Madonnia is one of the fiercest rivalries in World football, and one of the most special games in Europe. But it’s hard to remember a time when both sides came into a game in such poor positions. Inter a respectable 6th, but on the back of a season where they didn’t even qualify for Europe. AC Milan, on the other hand, hanging on in Champions League football but in the bottom half of the Serie A table. A win for both sides was important, for entirely different reasons. A win for Inter would see them just about keeping pace for that 3rd and final Champions League spot. AC Milan needed all three points to ensure they don’t fall into further trouble, going into the winter break. Internazionale: Handanovic; Campagnaro; Rolando; Jesus; Jonathan; Taider (Kovacic, 57); Cambiasso (Icardi, 82); Zanetti (Kuzmanovic, 68); Nagatomo; Guarin; Palacio. AC Milan: Abbiatti; De Sciglio; Zapata; Bonera; Constant (Emanuelson, 45); Poli (Pazzini, 87); De Jong; Muntari; Saponara (Matri, 76); Kaka; Balotelli. Playing against a 5 man midfield was always going to be quite tough, and therefore Allegri felt the need to prepare his side for the challenge by crowding his own midfield. The aim was to stop the Nerazzuri from dominating the middle of the park. This worked out quite well for Milan, as Inter lacked creativity in the middle of the park until the time Kovacic came on in the second half. Up until then, the likes of Muntari and Poli engaged Zanetti and Taider effectively, keeping Inter pinned back in their own area. Because of all the bodies in the middle of the park, neither side could really build their attacks very effectively, and that’s why they, especially Inter (79%), had dismal pass completion rates throughout the game. De Jong performs his duties well, providing power and strength in the defensive midfield zone, while Kaka is the creative head. But that’s about it, the remaining 3 midfielders (Poli, Saponara, Muntari) merely make the numbers. Two of those are young and extremely talented midfielders, players who want to see more of the ball, players who can contribute creatively, but there duties don’t entail such roles. Kaka, while still creatively solid, has been given too much freedom in midfield by Allegri. He sees a lot of the ball, but doesn’t bring the younger players into the game often enough. A team employing 3-5-2 can manage to provide adequate cover, but with only two at the back and De Jong in the centre, a quick counter from the wide areas is easy to catch Milan out (more on that later). Poli’s and Muntari’s midfield duties, thus, are more inclined to providing cover out wide, rather than contributing creatively. Allegri’s midfield is in a crisis, tactically they need to be sorted out. There are five central midfielders in there, and yet they aren’t able to conjure up decent chances for the striker. All the creativity flowed through Kaka, with some long balls being attempted by the likes of De Sciglio and Bonera from deep positions. If you’re going to play five central midfielders and have only one create everything, putting two on defensive duties in wide areas and another just to make the numbers, you’re just wasting a lot of talent. 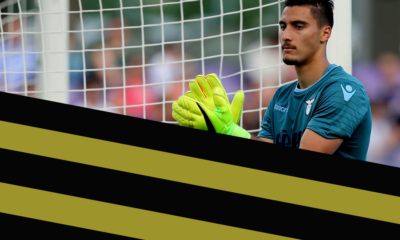 Saponara, for example, has been deployed behind the striker but doesn’t see enough of the ball (he made just 39 touches, as many as Handanovic), and is forced to drop deep. In the illustration above, we see the youngster making a good run into space in the centre, Constant passes to Kaka down the flank instead. He showed a glimpse of what he is capable of, nutmegging his opponent at the half way line, playing a through ball to Balotelli and taking his position at the edge of the box, Balotelli went for goal instead. Either Allegri changes his formation, or changes his tactics within this 5 man midfield formation. Both Inter and Milan lack a ‘winger’ in their tactical approach, preferring to deploying the full-backs in order to stretch the play. The approaches though, are different. Inter went with a 3-5-2, as expected, with Nagatomo and Jonathan the main wide threat. AC Milan too had their full-backs providing the width, with De Sciglio and Constant making runs down the flanks. 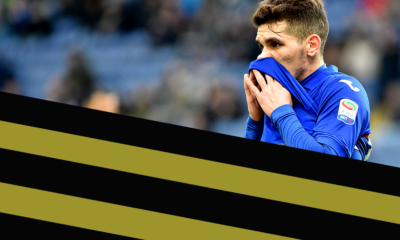 The problem here is that while Inter covered for their attacking full-backs with a three-man defence, AC Milan struggled as they employ just two at the back. It means that one of Muntari or Poli need to cover the wide areas, they are the main defensive block, meaning that a quick counter from the opposition can put their side in a good position. Muntari/Poli would have to move from the centre to the wide ares, but a quick ball down the flanks would forced the centre back out, leaving his partner alone with the striker. 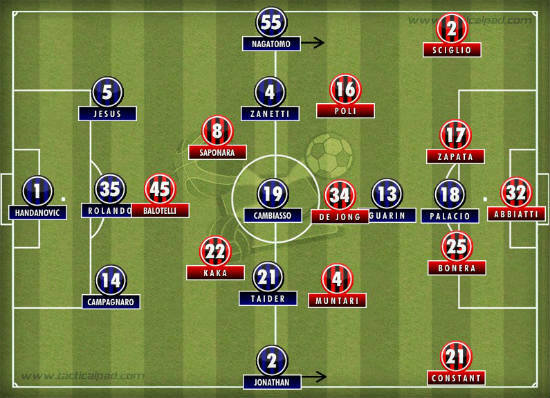 The 3-5-2 system that Inter employ relies heavily on the ability of the wing backs to influence the game. If used correctly, the system can be very difficult to play against. With all the crowd in the middle of the park, Inter needed an outball, but instead of resorting to punting it up the field, the Nerazzuri had the added option of playing it into wide areas, where the wing backs were more than willing to receive it. The way the two teams set up also meant that there was space in front of the wing backs, and the onus was on them to provide the attacking thrust to the Inter side. The duo of Jonathan and Nagatomo didn’t disappoint, and every time Inter threatened, it was because of a forward run from one of the two wing backs. Nagatomo did well in the game making 3 key passes (the most of any player on the pitch) and taking 4 shots on goal (again, the highest)., and getting an accurate cross, while his opposite number, Jonathan was crucial, completing 3 of his 4 crosses. The goal that Inter scored also came from a cross from the wide areas, and Inter created a few good chances with help from the wing backs. 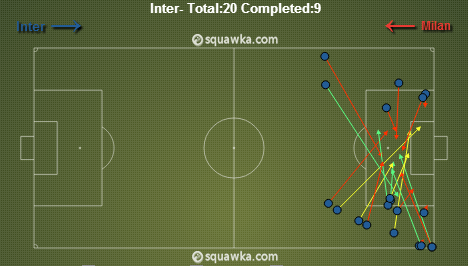 That right side was crucial in creating opportunities and proved to be the main attacking threat for Inter. Inter thus won the battle out wide with their full-backs more effective than that of their opponents, due to the cover being provided. One of the disadvantages of playing as the lone striker against a 3 man defence is that it is very easy for the defenders to mark the striker out of the game. Mario Balotelli found this out today, as the big Italian striker hardly managed to get the ball in the danger areas. There was one occasion when he did manage to run onto a pass and shoot, but every other time he was covered by the Nerazzuri defenders. This was due to the lack of support from the midfielders, who found it hard to break forward. While Saponara was virtually a spectator Kaka was constantly dropping deep to pick up the ball and try and make something happen. This lack of support and action up front induced Super Mario to venture out of the danger zone and drop deep, and wide to collect the ball. This allowed him to have runs at defenders, but meant that often, Milan had no presence in the penalty box (possibly why they attempted 0 through balls). As seen in the illustration above, with Balotelli drifting wide, Milan had no one forward to play to. The situation was no different with Inter Milan. With Milan crowding out the midfield, Inter were forced to retaliate. Nagatomo and Jonathan, though providing a wide threat, didn’t get forward as much as they would have liked, as they were required to assist the side in midfield to create space with some quick passes. Palacio stayed forward, and was often the only man in AC Milan’s half; he didn’t drop deep like Balotelli did, instead playing off the shoulders of the last man. It provided Inter a man to regularly play passes to, albeit, sometimes in vain. AC Milan’s approach this season has lacked consistent pressure from the front, with many labeling them lazy in their play. Much of their passing has been at the back, with rarely any midfield creativity. Teams have found it easy to win possession in dangerous areas against Milan, and Mazzarri’s men were expected to do the same. But surprisingly, it was Allegri’s Milan that started the brighter, closing down Inter, closing from the front and putting pressure on the midfielders. 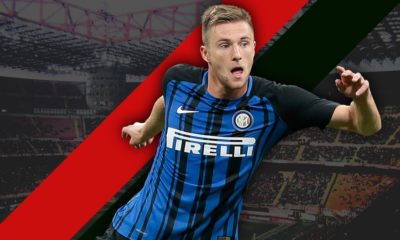 In the first half, Inter looked to be struggling to break out of their own half at times, with Milan bossing proceedings for long periods of time. Inter were trying to play the ball through midfield, but were failing because Milan were working very hard to stop them from doing so. Higher up the pitch, the Rossoneri tried to pressure Inter into making mistakes, and pushed their own defensive line quite high up to force the issue. Inter were going to be a bit cautious after getting picked off on the counter by Napoli last time out, and Allegri responded to this by making his boys press high up the field, to stop the Inter passing. As seen here, Milan pressed the Inter players when they were in possession, forcing the ball back to Handanovic. Credit has to be given to young Poli and Saponara who worked hard in midfield to regain possession. Inter are now in a good position to challenge for Europe in the second half of the season. They are 5 points behind Napoli who occupy the final Champions League spot. With a good young side, and financial backing from new owner Erick Thohir in January, they can definitely pose a challenge. It’s not looking good for AC Milan, while their rivals are 5 points off the Champions League spot, they themselves are just 5 points ahead of the relegation zone. We questioned Allegri’s future based on this result, it doesn’t look good for the boss. Expect a change in this holiday period. What did you’ll think of the game? Leave a comment below.